DAZ Studio Pro BETA, version 4.5.1.41, is now available! DAZ 3D is pleased to announce the next public version of the DAZ Studio Pro BETA - version 4.5.1.41! Despite our best efforts, DAZ 3D cannot possibly test the software under all possible conditions. So, we are providing this version of the application to the general public in order to uncover problems that were not discovered during internal testing. We expect that there will still be problems and we hope that when users encounter any problems, they will report them to the Bug Tracker so that they can be validated, prioritized and fixed. As with any software classified as being in the BETA phase of development, you should expect to encounter bugs. Any bugs you do encounter while using BETA software can vary in terms of severity, from minor features that do not work correctly to problems that cause your computer to crash. Before choosing to use BETA software for production purposes, you should decide whether the benefit of new features and bug fixes provided by the BETA version outweighs the risk of instability you may encounter. The 4.5.1.41 version resolves several issues and implements many improvements since the 4.5.1.6 General Release. More detail on specific fixes/changes/improvements can be found in the Change Log, which can be viewed online within the Documentation Center portion of our site. All new downloads of the DAZ Studio Pro BETA product (SKU: 12000) will be of this version. 1) Fixed crash when loading dynamic clothing that has a material applied to it. 2) Fixed Transfer Utility to not remove unused bones if not projecting weights. 3) Extended Filter Weights to allow filtering of multiple maps at the same time. Yes, the Genesis Starter Essentials content that is provided with the product has been updated to version 1.9. If you have previously added the DAZ Studio Pro BETA product to your account, simply locate it within your Itemized Order History and then click the "Reset" link on its immediate right. This will cause new links for downloading the latest version to be added to your My Downloadable Products list. If this is your first time downloading DAZ Studio Pro BETA, simply follow this link, click the "add to cart" button on the page and then follow the checkout process. Uninstall the old version before you try to install the new version. Unfortunately there is no trace of my prior uninstall left after running this installer, It seems it has removed something critical as it no longer shows in the DAZ start menu folder or in the control panel. Good news is DAZ Studio 4.5.6 64 is still intact so no problem there, hopefully I'm the only one that is having this problem and if that is the case I'll wait until the release candidate is available. Can't get the beta to run under any version of Wine...nor any 'bit' format. Both the 32 and 64 bit versions will load and start, but the moment any content is added it crashes. This occurs somewhere around the 99-100% mark in the 'reading asset' box. Really wanting the 3Delight update, but oh well. Yup. Newest DS4 is a complete failure under Wine. I'm getting an OpenGL failure under Wine 1.5.3 -> 1.5.16. From 100% working to startup failure. Wine Success! Partial anyway. More information as I have it. I have managed to get 4.5.1.41 up and Genesis loaded. Well, that was short lived. Back to crashing at trying to start viewport. .41 is a total loss for Wine users. bug report here but since Wine is not a supported platform I don't think it'll be recognized. I had a "new" Fedora17 install that had nothing Wine or DAZ related installed on it. So, I decided to use it to get some detailed trace information to submit to the bug tracker. I install Wine 1.5.16(64 bit) from the yum repository. Then I install the DS4.5.1.41 (64 bit), from now on referred to as "DS4". The installer complains and hacks and coughs, but finally finishes. I start DS4 running a fairly detailed trace. The screen on this machine is a 16x9 1366x768 LCD and is slight too short for the DS4 startup dialogs to fit on (HINT DAZ!!!) and I have to blindly flail around using the TAB and ENTER keys until I work my way past them (making sure to select "Don't show this again"). Finally, I have DS4 on screen showing an empty Viewport. I exit, and DS4 crashes. No problem, I was done. I install the Genesis essentials and it installs without complaint. I then restart DS4 and run into a multi-thread deadlock where the "default load screen" is trying to load Genesis, and the Metadata load dialog is trying to install the Metadata... AT THE SAME TIME! So... on a 2.1Ghz DualCore machine we're now waiting... and waiting.... and waiting... I have nothing else to do on the machine so I set it aside and do other things. Eventually, it works its way through the situation and I'm looking at a viewport with Genesis. Smart Content is behaving, things are turning Orange as I mouse over them, there is the normal ATI OpenGL lag on input. I exit DS4 (no save), and get the crash dialog. I restart DS4 and load the RtR Dragon Slayer scene. It loads, but doesn't display until I mouse over the viewport. ATI lag... again. Anyway, things seem OK, change the theme to City Limits. Change occurs, set the tool to bounding box only, still OK. Exit DS4.... no crash this time. Restart DS4, relatively speedy startup. Set the layout to Highway, then 3D Bridge, then Full Service, then back to Highway. Everything changes as expected, exit DS4, no crash. Restart DS4, no crash. Close DS4, no crash. Been drafted to brave the crowds by the female contingent. Will continue later... if I survive. Installed and checked things out last night. All works fine. I'm going to try the GoZ Bridge and see if it's back to working a bit faster. This past couple of versions it takes a bit of time to invoke... might be a ZBrush thing.. who knows these days! Thanks for the beta. Possibly related to my problems with trying to get the beta to run. Anybody having install problems with Windows 8? I tried the regular way but keep getting error messages with main installer and content and plugins. Tried a complete uninstall of version 4.5.1.6 and tried installing new beta but still getting error messages. This the first time I have had problems installing any version. What are the file sizes for the files in the Beta? I've been having trouble getting everything to download and want to make sure the files didn't have any problems. I can't tell you all of the sizes, just the two I've downloaded. And 164 MB for the 32 bit version. D|S is doing a fairly extensive query of the OpenGL layer upon startup. Are you using a proprietary video driver? If so, there may be a missing routine or two that is getting flagged with this version. It took reinstalling the driver and reinstalling WINE to get it back. Using winedebug made it easy to spot...the crash dumps from the crashes, much less than worthless (Unknown error in Kernel32.dll...and so on). The difference is amazing. The number of extensions not initialized on OpenGL2.1 is rather alarming and to me explains why some people could be having such trouble 4.5 to run. Before I got it fixed, it was acting a lot like many people describe DS acting...the constant crashing when doing anything, the not loading at all and if it does, absolutely crappy viewport behavior. Just a rough guess on my part, but I'd say a completely working OpenGL of around 3.0 is really the 'practical' minimum for DS4.5. I wouldn't go that far. There are some features that will probably be leveraged if they are available, but I doubt seriously that OpenGL >1.4 or 1.5 is necessary to actually use D|S4.5. I'd have to run a lowlevel trace to know for certain, and I'm too busy helping a friend on a coding project right now to take that kind of time. I don't understand what this means. Do I have to change something in my folder structure, or is this all internal and invisible to the user? No, it means for some reason they have changed the default that is placed in the entry field when installing if there isn't a previous value. The name of the folder is not functionally significant so you can continue to call the folder whatever you like - you shouldn't even notice that the default has changed unless you install on a clean system without a stored previous setting. Why can't I orient tabs across the top? I select it and the tabs just vanish. Never mind, close it opened it and there are the tabs. Yes I just got this downloaded and installed today. Next question. Does dynamic clothing not work in this? Nothing loads, yes I installed the dynamic clothing control even though I can't use it. I'll assume since there is no dynamic clothing tab it doesn't. edit to add, checking "do not show this again" doesn't work. It still shows the intro tutorial/walk through page every time. 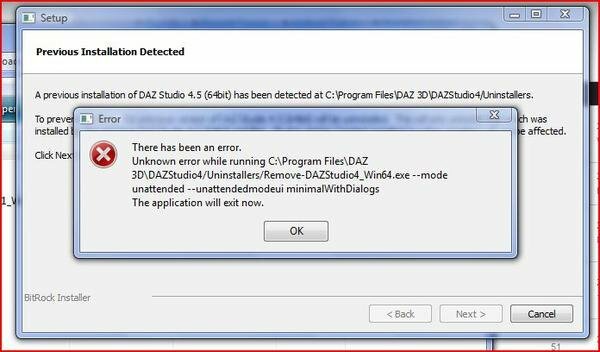 anyone with Windows 8 know how to unlock the read only status of the daz studio 4 folder? its preventing the install as its a read only folder and no matter what I have done I cannot make it an all access open folder. I unselect read only.. it applies the changes ( or appears to) but when I go back into it the folder is still read only. I am getting this error message. and I am not sure that the prev version was uninstalled correctly. BTW: The 14812_GenesisStarterEssentials_1.9_trx.exe appears to work fine with DAZ Studio Pro BETA (4.5.0.137) (64-bit on Windows 7). This coupled with your previous post sounds more like a Windows problem than a DS one...namely permissions/account restrictions. I'd say either you are having your AV software kick in and mess with install or Windows file protection is kicking in and stopping the install. As for the other...when you check the "Don't show this..." box, there should be two buttons to the right (bottom right hand side of the window). One will close the window without saving the choice (I think that's Cancel) and the other will save the choice (I believe it is grayed out until you check the 'Don't show' box). I notices that all the files that had the modification date of 10/8/2012 from that install were the ones that were not properly uninstalled. I got it to work..
probably not the best practice and may cause Issues but I manually deleted all the files that had the modification date of 10/8/2012.